When I announced that I would be adding 5 traditional German recipes to the cookbook, including a recipe for vegan Zwiebelkuchen, one of my Kickstarter backers wrote to me with a special request. His birthday is tomorrow and he asked if I’d share the Zwiebelkuchen recipe earlier so he could make it and serve it with traditional Federweißer (“new wine”) for a birthday party. I told him I’d get to work on testing and finishing the recipe and would get it to him today. I made it last night and it turned out even better than I hoped! Zwiebelkuchen is sort of like a cross between French quiche and Italian thick-crust pizza, but it’s also reminiscent of German Flammkuchen, which has a thinner crust and less toppings. 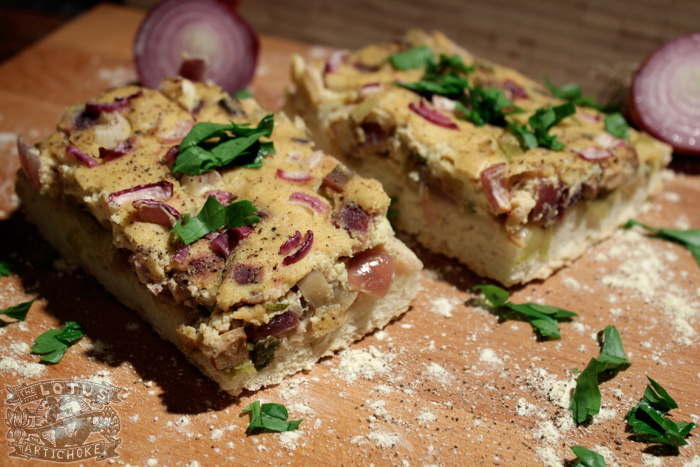 This is a tasty savoury cake which actually has a lot less onion flavor than one might expect. The result is a delicious and hearty meal which stirs memories. It takes some time and involves a lot of steps, but it’s well worth the effort! Mix 1/2 cup warm water, yeast, and sugar in a small bowl. Measure flour and salt into a large bowl. While mixing, slowly add yeast water and gradually add rest of water and oil. Combine well and knead smooth, about 5-7 min. Cover and allow to rise for 1 to 2 hours in warm place. Heat oil on medium heat in a large pot. Add chopped onions, paprika, pepper. Saute 5 min, stirring regularly. Add diced smoked tofu, continue to saute until onions are transparent, about 5-7 min. Blend tofu and soy milk in a food processor or blender until smooth. In large bowl combine ground cashews, yeast flakes, chickpea flour, and soy flour. Add lemon juice, zest, turmeric, rosemary, nutmeg, salt, and blended tofu mixture. Whisk smooth. Line a baking tray with waxed paper or grease pan with oil. Knead dough a few times and spread or roll out evenly and thinly across pan. Pinch or turn up edges to be slightly thicker to contain filling. 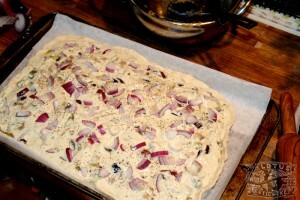 Spread half of onion filling across dough. Pour tofu mixture evenly across filling and then spread rest of filling and perhaps more chopped onions on top. Bake for 35-45 minutes until a toothpick comes out clean and top of cake is golden brown. Remove from oven, allow to cool. Garnish with chopped parsley and ground pepper and serve! Sunflower seeds: Use ground sunflower seeds or other nuts if desired. Flour: Use regular flour instead of chickpea flour. Other herbs: Experiment with thyme, ground coriander, sage, ground caraway seeds or other spices in your filling – or crust! This entry was posted in Austrian, German and tagged German, leeks, onions, tofu, vegan, zwiebelkuchen. Bookmark the permalink. Let me know if it try it! Since it’s all from scratch (homemade dough, too) it’s even more satisfying when it turns out well! I’ve never seen smoked tofu. Did you purchase it? If so, where? Or did you make it? This looks incredible!! I’m excited to make this! Thanks… it’s a fun recipe! You can totally make it with regular (firm) tofu, but smoked tofu or a flavored tofu is fancier. I’m not sure where you’re living– WholeFoods in the US carries a wide range of tofu, and in Europe most of the health food stores that have tofu also have special varieties. You can smoke your own tofu, too… I’ve seen a few good recipes/blogs about it online.